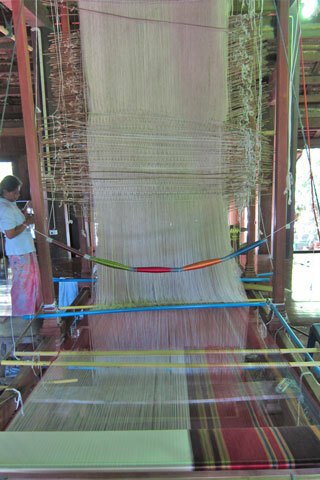 It was unclear to us whether Baan Tha Sawang has been producing silk for centuries or is a more recent development aimed at bringing in tourists (we received mixed info in the village itself), but it’s a pleasant place to spend an hour regardless. A handful of places put on traditional silk weaving displays, but the best are in gorgeous open-air wooden buildings surrounded by gardens down a gravel path (look for the wooden gates on the right when walking into the village). Here you’ll see giant traditional looms that require four people on two different floors to weave the silk. Also notice the antique bureaus and beautiful ceramics used to display examples of fine silk. After watching the elderly women work their magic, you can see how the silks are dyed, and get plenty of chances to buy fine silk wears for far cheaper than you’ll find in Bangkok. A couple of restaurants and cafes are also found here. Displays are held at 13:00 daily. Baan Tha Sawang is 10 kilometres northwest of Surin town off Route 4026. From Surin, take Thung Poh Road out of town and look for the signs. If you have a good map or GPS, you can continue north from here and eventually find your way to Baan Ta Klang.